Ordered this laundry cart to replace an old broken down one that my mother has used for decades. This one is a near exact replacement and Mom loves it. Hope it lasts her as long as the original! It is easy to store out of the way until needed. I put a large plastic bag over the cloth this way when you put wet clothes in to transfer to the dryer all you do is wipe it dry and then when the clothes are dry you just put them in the cart to fold. For the price you can't beat it. make it easy to move laundry from closit to machine. I have balance problems, this is a great help. This has been a real life saver!! I have a bad back and trying to carry my heavy basket was a chore in itself. This cart is the perfect height for me and it has made laundry day a pleasure. Even my daughter loves it! My mom is elderly and I thought this would be great for her to just roll to the washer and dryer. Glad I found it. perfect height for washer an dryers on pedstals. just what i needed an wantd very pleased. easy to assessembly. It's easy for me to use with my cleaning around the house. I always hated laundry day, because I have trouble bending. this cart rolls up to the washing machine, and dryer. It is lightweight and rolls easily. This is an out standing item. I am a widow living in an independent living facility. this is wonderful for me - easy to transport my limited laundry and easy to fold and store. A great help on laundry day due to back problems. Don't get so tired now. I love this cart! The only thing that is wrong with the laundry cart is that you have to pin the laundry bag on the cart, or it will keep slipping off, which was easy to do. I have brought 3 already for family. It saves my back and I don't have to lay clothes everywhere before I am ready to fold them. Folds and stores very easy. This is great to move my clean laundry from room to room, wet or dry. The bag dries quickly and wicks moisture. Lightweight to lift over slight thresholds etc. Narrow enough to fit through most tight areas. Pretty good capacity! I owned one of these over 50 years ago. Was thrilled to be able to buy it now as I am older and find it difficult to carry a laundry basket. I'm so happy with this purchase! It wasn't hard to put together, and makes bringing laundry to the other room to fold, quick and easy. A super buy in my book! Yes, I would buy this item again. As soon as I received the laundry cart I assembled it. Very easy to do. It has made my laundry day so much easier. Laundry was becoming to heavy for me to carry from laundry room to the bedroom. The cart has made it so much easier. Lightweight, functional and easy to handle for elderly couple who still do their own laundry. The cart goes through doors easily to move laundry from room to room. Makes laundry so much easier. I use this cart to take the clothes from the dryer to the table to fold them. No moe trail of droped socks. Or I can even fold the clothes directly from the dryer and place them in the cart to roll to various rooms to put the clothes away. Best purchase I've made this year. For household use-NOT professional use. As an older couple we try to make our life as simple as possible. This cart is NOT heavy-duty but it does allow us to easily move our clothes from the laundry room to our bedroom. It was easily put together and stands even with the doors of the washer and dryer. This allows us to take our clothes in and out of the machines without dropping the clothes on the floor. We love this little cart. It is not for professional use but for us, we're so glad we bought it. Very pleased with my two carts. They push, right up to my washing machine and I can easily put the clothes in without bending my back. With back problems this is very important to me. MY LAUNDRY CART IS VERY GOOD ,I AM AN AMPUTEE AND I CAN USE THIS FOR OTHER THINGS LIKE PUTTING KIDS CLOTHES AWAY,PICKING UPTOYS AND PUTTING THEM IN THE CART,IT IS SO GREAT TO MOVE WITH NO PROBLEM BUT THE ONLY THING WRONG IS WHEN I PUT TOO MUCH IN IT I HAVE A LITTLE TROUBLE MOVING IT GUESS I WILL HAVE TOSTOP FILLING IT SO MUCH. This cart makes laundry day so much easier! I have hardwood floors and I just wheel it room to room...I love it! Thank You for having this!! I have been looking for this forever--and I picked up 2 extra liners for multiple loads. This makes getting laundry from the dryer to the folding table to the closet so much easier--easy to roll, easy to remove liner to use as a basket, and it folds up to take up next to no space when you don't need it. It could not have been easier to assemble--the wheels were already on it. Only possible improvement would be to add handles to the sides of the liners--I added my own to aid with carrying up and down stairs when it is full. Makes it easy to get laundry from the machine to the line and keeps large items like sheets and towels from hitting the ground as they can be hung right out of the cart. WE ARE FULL TIME RV PEOPLE. THIS IS GREAT FOR RV PARKS. THE WASHERS AND DRYERS ARE USUALLY A FEW FEET AWAY FROM EACH OTHER. NO NEED TO GET WET CARRING THE CLOTHES. Easy to put together and compact to store. Easy on back when it comes to getting clothes to clothesline and hanging up clothes. this is something I have been looking for a long time nd it fits my needs just fine. like the 1 my mother had years ago when I was a small child. The cart makes doing my laudry easier because I don't have to lift the heavy loads of laundry any more. I don't need to carry laundry baskets anymore. So I put the dirty clothes in this and wheel them to the laundry room. When they are finished, I fold them up and take the cart back to the bedroom to put them away. It does just what I wanted it for. I bought this product when I was recovering from a hip fracture. It is so much easier to roll this basket rather than trying to carry the plastic laundry basket. It holds plenty and rolls easily. Great height for unloading and loading clothes in washer and dryer. Easily rolls from bedroom to laundry room. Light and folds easily to put out of the way. Perfect for someone like me. several back surgeries, can't bend down or over. this cart keeps me from doing any of those bad things. I needed this after hip surgery as i cannot bend all the way down. it helped greatly, i also used it when putting Christmas decor away, i went from room to room putting little things in then put them all away at one time! I LOVE THIS!! MAKES DOING LAUNDRY SO MUCH EASIER! IT IS LIGHTWEIGHT AND EASY TO ASSEMBLE. I HAVE ALWAYS WANTED ONE OF THESE. IT FOLDS UP NICELY WHEN I AM FINISHED WITH IT AND DOES NOT TAKE A LOT OF ROOM TO STORE. I THINK IT IS A GREAT VALUE FOR THE MONEY! AGAIN I LOVE IT!! I live in an apartment building with laundry in basement. This cart makes moving laundry back and forth extremely easy. I got this for my Dad who needs to trasport his laundry down two long halways. He is somewhat disabled and unable to carry a laundry basket. This product is exactly what I was looking for and was unable to locate elsewhere. Thank you so much for carrying this item and at a reasonable price! Laundry cart saved my back! This cart is great for someone with back pain. It is higher than my old one and very easy to push, even on carpet. I even put it together myself and I am a senior citizen! I really like the cart. This is a great alternative to an expensive steel laundry cart. Makes a huge difference. Laundry is a pleasure to do now. Keeps those loose, small pieces like socks, etc from falling in the floor. I am in a wheelchair, and the cart makes laundry day much easier. I can transport from one room to another with ease. Wheels turn easily in any direction. The cart is always within easy reach for dirty laundry and folded clean laundry, so I wish it would come with the floral basket. We were looking for a laundry cart to use in a smaller space ..one that could fold up and be out of the way when not it use. This is PERFECT!! And the price is right. A great roller for dry clothes instead of a basket. My basket holds my dirty close and this item holds my clean ones. I live in a senior complex and we use the washers and dryers on the floors. We don't have personal ones. I keep this at the bottom of the stairs and throw my laundry down into the basket. then wheel it over to the washing machine. Miles Kimball catalog. Thank you Miles Kimball. No more carying heavy laundry basket,Just put dirty laundry in & roll it to washer,when done drying clothes put clean clothes in basket & roll it to rooms to put away. Excellent product and a back saver, too. Saves me having to carry loads of clothes. Also good to hold washed items while waiting for the dryer. Need this because I can't bend to do laundry. This allows me to roll my laundry right into my closet and put them away as I fold them. I really like the hamper as it keeps the clothes up off the ground and it is handy to pull around.It makes it so much nicer that bending down to the ground to get the wet clothes to hang on the line. I really like the place on the hamper for the clothes pins. I bought this to replace one I had gotten elsewhere. It is much sturdier than the one I had and I feel it will last a long time. This cart does exactly what i had hoped. I can noW roll my laundry in to the washer instead of trying to lug a basket full of clothes. Sure does help my lower back and i dpdon't have to ask anyone to carry for me. Rolls very nicely on carpet as well as bare floors. Love it for taking washing out to hang to dry. I have no bad things to say. I have a back injury and now I dont have to carry laundry anywheres. I fold it right from the cart and roll it into the room its going to. I might get another one for my mom. exactly what I was looking for just fit s in closet great !! I have a small laundry room. It fits perfectly in my laundry room. I love it! Easy to use and the cart brings the laundry right to waist height....no more back strain! It is lightweight and easy to maneuver around! Can't believe it took me 63 years to know how much I could benefit from using your laundry cart. It's saving my back and makes life much easier....wish I'd thought of it 60 years ago! The lettuce keeper and knife are very satisfactory, too...doing exactly what I expected of them. I love this laundry cart. It is absolutely perfect for taking the laundry out to the line. The liner broke after about a year of major wear and tear, no complaint there. Love it and would recommend it to anyone!! Saves my back when moving laundry to the washer, from washer to dryer, from dryer to folding table .... just love it! I love it. Easy to put together, it rolls super easy, it holds a very large load of laundry, if not more, it folds easy to store in my laundry. It looks flimsy but it works great and has made my life SO much easier by not having to lift heavy clothes baskets containing clothes fresh out of the dryer. The only problem I had was a wheel was missing when I received it, I called Miles Kimball and they sent me a completely NEW cart. That was so nice. The doors on my washer and dryer open in to each other so it is difficult to get wet clothes to dryer without dropping them onto the floor. The laundry cart has solved that problem and also in getting them to the area whereI hang them up. We ordered this product for our grandmother who is 85 yr. old. She lives in an apartment and her laundrey area is far from her apartment. It was very hard for her to carry those laundrey baskets down and back. its come to the time at my age that its difficult to carry a laundry basket or bag with dirty clothes to the laundry room. I ordered this and am very pleased. Easy to set up and I've gotten lots of compliments and questions as to where to buy one!! sturdy and easy to push when full of clothes. love it!!! I had no problem with assembly, which is rare! 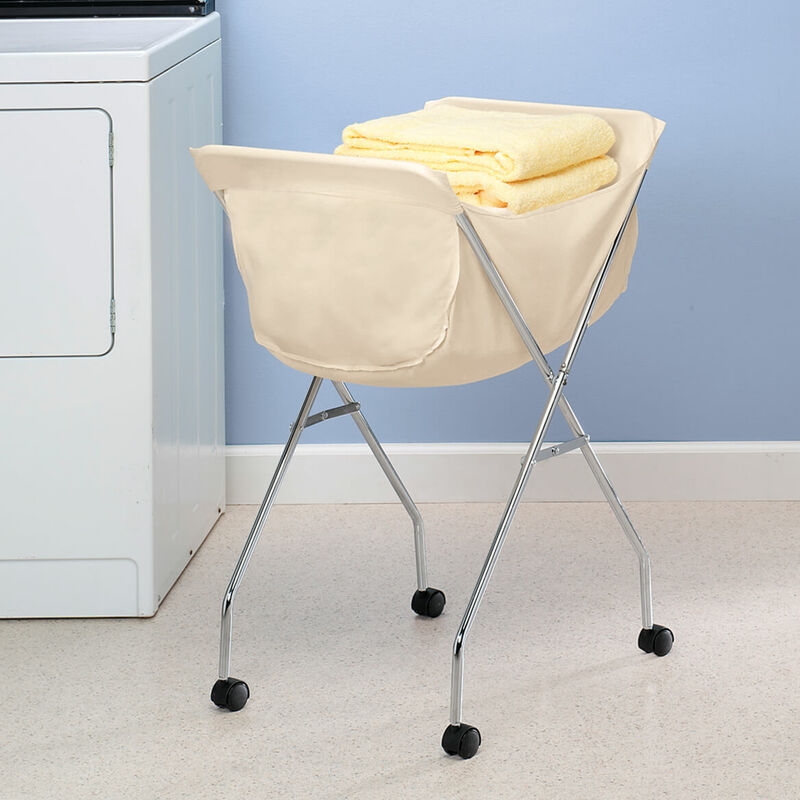 This laundry cart makes doing laundry a lot easier. No more lifting laundry to take to the washer and bring out of the dyer. I can simply pull clothes straight from the dryer and into the cart and roll it to my room. The height is perfect. I love that the fabric liner is washable; another nice thing about the product. My mother had one of these laundry carts when I was a girl at home. I was thrilled to find it still being made and ordered one right away. Best thing I ever did. Easy to use, rolls well, sturdy construction and it folds up when not in use. Glad I found it! I remember these carts from when I was a kid, so I jumped at the chance to get one at a decent price. It went together fine, with a little tweaking. I use it in my laundry/utility room, because my washer and dryer doors on my front-loaders conflict. The two appliances couldn't be switched because of where the water and electrical connections were when I bought the place. This cart makes it very easy to transfer the wet clothes into the dryer. It is also easy to get out of the way, since it folds up. I bought the floral liner also, but I haven't had to use it yet, since the original liner is still clean. At last!!! I have found it!! I have had a cart similar to this for years and it is getting pretty beat up. I have searched for a replacemant to no avail until now. What a thrill to find it. While it is not built as sturdy it still serves the purpose and I am very thankful to find it. Keep up the good work!!! A replacement for similar one that lasted 20 years. I should of had this sooner!!!! pedestals that are so high. Just what I needed. Would suggest stronger legs and wheels. The cart is easy to assemble, lightweight and is very flexible when maneuvering around tight corners. I wish I knew about this cart years ago! Such a blessing. Very useful with front loader washer and dryer! the washer/dryer I use are one on top of the other. Washer, bottom has door on right, Dryer, top has door on left. The laundry cart comes very useful to transport washed clothes to dryer, and to table when everything is done. This is perfect for everyone, but ESPECIALLY if you have a bad back. I recently had back surgery and I am unable to lift anything over 10 lbs. Since I live in an apartment building, I have to lug my laundry down the hall several times each week which is no longer possible. The height on the cart is just right, it holds 2 large loads at a time and it collapses for easy storage (I keep mine behind a door) and the liners are washable and easy to slip on and off. I definitely recommend this laundry cart. This cart will save your back. No more bending to pick up piles of laundry from floor. I use when I sort, use to hold small items that I like to dry all together, etc. Even use to hang heavier pants/shirts on the side to air dry while waiting for the dryer to be freed up with other things. Just bought one for my daughter who has a new baby and she loves it! I have a bad back and I can roll the cart around very easy to do my laundry. Great product. I bought an extra liner just to keep on hand for future use. This is my second laundry basket on wheels and I love it,this one is actually made better than the first one very convenient to roll around the house and not have to carry.My kids even help with the laundry.I would recommend it to everyone. 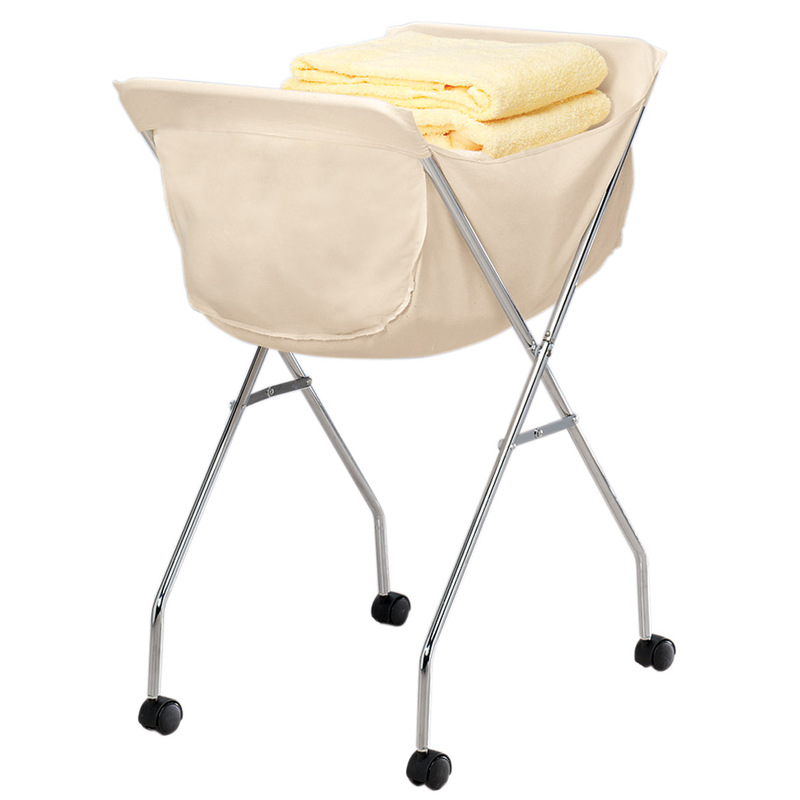 As an older widow with some monility problems this toll anout laundry cart is a real blessing. This cart makes moving and folding laundry so much easier. I am going to buy more of this cart. I have a long house, I use two carts for separating the laundry during the week and then wheel the cart to the laundry room easily. My mom had one and I needed it. So nice to not have to bend over as Michele as I used to. IT IS USRD BY ME IN A RETIREMENT HOME. Handles a huge bag of laundry, keeping everything at waist length so you don't need to bend. Just like the ones in the laundromats, only cheaper! The handy liner can be tossed in laundry for cleaning. Pockets on one side of the liner allow you to store laundry essentials like detergent or clothes pins. A perfect addition to our laundry room. I was so glad to find someone who sells a wheeled laundry cart. We hang our clothes outside to dry on the line but when our last cart gave out and I started looking for a new one, it was very hard to find any. I checked in local stores that you think might carry something we needed. No. I looked on line at those same places and others as well. NO. At last I found this one at Miles Kimball. It works fine and I'm happy with it. I LOVE this laundry cart. This laundry cart is great. I bought two. I don't have to bend over to retrieve the clothes. It's very large so it holds a lot. I have a bad back, this is perfect,I don't have to bend. It's light and It folds to put I away in small areas. I just love it. This was a replacement of the same type product I have used for years and can't live without. Clothes from dryer to closet lay nice over the ends without wrinkling & the center is great to get laundry to the washer without breaking your back. If you are older or handicapped this is a real handy tool. I use this little cart to roll back and forth from the bedroom to the laundry room, because I have very painful knees and have a hard time lifting heavy baskets. It saves a lot of pain and trouble. I thought that such a cart was no longer available and was delighted to find just what I was looking for. The cart makes moving the laundry from one place to another a breeze. This cart appears somewhat better made than the first one I'd bought (two, actually, as the first was unusable - both of which fell apart quickly; these were purchased from a different vendor). Easier to assemble, all parts were included, and those parts fit together properly. Nice sturdy cart, bag is sturdy, like the height and overall feel it's quality. The wheels do not roll the easiest, but I would still purchase this. Very pleased! I remember this from my childhood! I enjoy using this while taking clothes off my clothesline. it make the job easier to fold and put laundry some place close and clean. Purchased 3 laundry carts because I was having issues with my back. No longer have to lift heavy baskets full of clothes. I rated the cart 4 stars because the casters did not insert completely into the metal legs. The casters fit after shaving off some of the plastic from them. So much better than bending over! The only complaint I have is that you put the clothespin pocket on only one side....otherwise I love it! Sure beats bending over to pick wet clothes up from a laundry basket and then trying to find the clothespins. I love my new laundry cart. It's much sturdier than my old one, and rolls easily. It makes moving baskets/laundry around a lot easier! I really like this laundry cart, although the fabric basket is actually quite small. I needed this for myself only.One load of wash or so works well.I would have preferred the pink color fabric but could not find how to order it, but this will do just fine.I would recommend it to anyone who has problems carrying awkward laundry baskets.It is lightweight so one load or so works well with this great item ! Saves my wife's sore back ! I have a very small utility room with no room to fold clothes so I have to load them into baskets and haul them to the table to fold. Age and injury doesn't allow me to haul baskets anymore so this was my solution. I turn the cover wrong side out load the dirty clothes in roll to washer dump them in, turn cover right side out to put the clean clothes in and roll to the table to fold. Put the folded clothes in and roll to put away. NO BASKETS!! It's a back saver. Cover goes on and off easily and easy to wash. Frame is a little weak and wobbly over door thresholds and rugs. Pulls better than pushes. Fits through doors and around corners. Fine for indoor home use. Folds up for storage. Works great for me. This is great because I have a back problem. Makes laundry day a lot easier. This laundry cart is a must have. It is a handy tool If you need help. It folds for storage till you do the laundry. 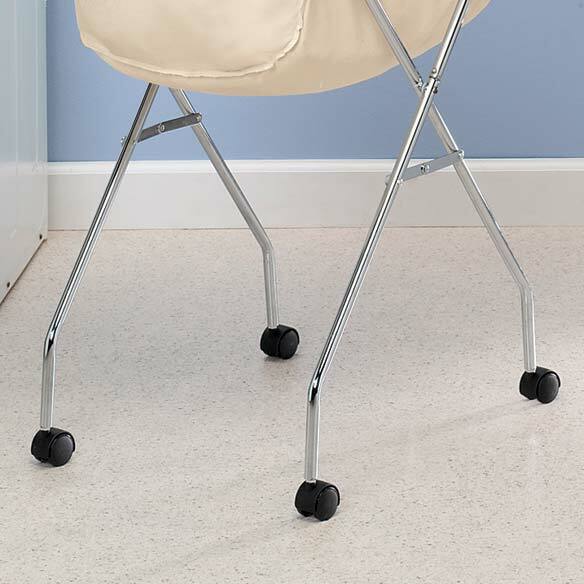 It stands high so you do not need to pick up your heavy laundry basket and after folding you wheel it to the closet. Seven years ago I bought a collapsible clothes-drying assembly so we can hang laundry outside to dry instead of running the gas dryer. Ever since, we've looked for a wheeled laundry cart. Recently a Miles Kimball catalog arrived, and there was the cart! It came soon after ordered. It is great. The wheels are about 2" diameter, not 3" as advertised. It's top-heavy when loaded, and will tip over if the small wheels catch on pavement grooves. I make sure to pull, not push, with a secure grip, and there's no problem. Thanks! The product is perfect for an elderly person who can just push it along with all their cleaning supplies. It is lightweight but holds quite a bit of laundry. I bought this for my mother in law, she usually uses a walker, now she can do her own laundry easily. This item maneuvers over the carpet quite well, which was my initial concern. We use it for the transfer of clothes from the dryer to a work area in another part of the house. My elderly parents are happy with how functional it is. Thanks Miles Kimball! Happy and Prosperous New Year! This is a cart that is otherwise hard to find anywhere else. I use it for taking laundry from the dryer to the rooms the clothes belong in. I too, have had and am having trouble with the wheels. The first cart I bought the wheels just didn't fit at all and they were kind enough to send me a whole new cart at no charge. They worked ok but keep coming unscrewed and won't roll real well on my floors. Now the wheels sides are coming off and I once again need to replace the entire cart. For using it 2-3 times a week just to put clothes away I feel it should last longer. Fixing the wheel problem shouldn't be that difficult. Miles Kimball is the only place around, that I have found, that carries a cart like this so I wish they would speak to whoever is responsible for the carts and wheels and please fix the problem! This is a great product!!! This is a great product Yes you can use it for laundry but it also allows you to place things in it so you can go from one room to another hands free. Really love the fact that the laundry cart is high enough that I don't have to bend over to place laundry in the basket. It is also very convenient to be able to roll a dried load to a counter where they can be folded. The added benefit is the folding feature which keeps it stored out of the way when not in use. The only con I see is that the rollers are a bit flimsy but with care should last a long time. I use this in the house to push laundry from bedroom to laundry room. When you pull the cart works great but when you push the cart wheels stop turning. I walk with a cane so this is a nuisance would rather push than pull. Otherwise I like it this has been the only problem. I never used it outside though only in house. Easy to put togther. No tools needed. Useful to my mother who can't bend over or carry a laundry basket. If you can't lift - this is for you. Every time I carry the basket out to the clothes line, it brings back memories of growing up and my mom doing the same thing! Thank you for helping keep a memory alive. for people that have leg or back problems. I had surgery 7 months ago. I CAN'T push it over rugs so I pull it. No place to store it for it doesn't completely fold up all the way. It is behind a bathroom door. I love this item! My Mom had one when I was a kid and searched a LONG time to find one. I love it. The only thing they could improve on is the wheels. They should be a little bigger and better quality. This cart serves it's purpose. It is easy to assemble and light weight. I would like for it to be a little heavier in it's construction. I'm afraid I am going to tip it over. There is nothing to lock it in place so it wants to fold if you try to lift it. I'd also like th wheels to be a little bigger. But I will certainly continue to use it. My washer & dryer are in the basement and are about 30 feet apart. I can carry the dry laundry O.K. but the wet laundry was a Tussle so I purchased the laundry cart to carry the wet laundry. Even though the wheels are only 1-3/4" dia. it does very well on the concrete floor and doing laundry is much easier on my back now. Thank you "Laundry Cart". That unless you are rediculously overloading it or dragging it over gravel, it will work just fine for average laundry needs. I had no problem putting it together. You should be pleased with it as I was. If not, there may be a defect I didn't experience or you may be expecting a heavier model like you would find in a laundromat. I like it for the money! Love this product, but I would be willing to pay a little more for a more sturdy, long lasting product. After surgery I could not lift over 10 lbs. Laundry cart has been really helpful. The only problem is the wheels. One half of the wheel cracked, and is unrepairable. The wheels are cumbersome because they work loose, an fall out. Currently hunting for a replacement set of wheels. Otherwise a great product. To keep clean clothes after drying. it is lightweight. I would prefer a cloth basket of sturdier material and sewed with rounded corners. My mom had carts like this in the 70's. Nice to have my own. It is not as well made as the older ones but I really like it anyway. This laundry cart has been a real help for my mother, who has arthritis and has had knee replacement. Carrying a basket to the laundry room was difficult for her. Now she can load this and roll it through the house, and hold on to it to steady herself as well. As a senior citizen, this cart is easy on the back, easy to use, folds up for storage. basically a fine item when the wheels stay on. It is perfect for carrying laundry from the hamper to the laundry room and then after drying. We have lots of area rugs and it hangs up moving through over the different heights. I love that I can roll my laundry to the laundry room, as I am unable to carry it. It is compact enough to fit in the laundry room and I do much less bending. Am disappointed that the bag does not have side pockets as shown in picture of item. Overall very pleased with product. my mom likes this cart because she has arthritis and so this makes it easy to transport laundry to the laundry room. The only problem is that the holes don't line up for assembly. she can still use it, but you can't put it together properly. I have hip displasia in both hips & use crutches to walk with, there fore cannot carry a laundry basket. This cart has helped tremendously! I would prefer to have the kind that have the bar to hang clothes on, but don't have room for it. I needed one that folds compactly when not in use! We bought this for an elderly woman who walks with a cane. Great idea but doesn't roll well and is rather hard to push. I think this needs better casters. I have had this cart for 3 years using it to catch clothes under my basement laundry chute. Then I just roll it over to the washer. It is weak, but is a great help in my basement. However, the liners are very weak. In a short time I was adding safety pins. And after a year even that couldn't keep them together. So stock up on liners. Very few other companies make a cart like this which is wide and shallow so the small extra expense is worth it. Bag is not as deep as I wanted. Easy to put together but bag can slide off the cart. I use this to wheel my wet heavy clothes out to my clothesline to hang. Yes I'm old fashioned....But this is great because I have disabilities and this is a HUGE help to me. My old one lasted years and I missed it while awaiting a replacement. I got my new one which was badly bent...I tried to un bend it to no avail. Miles Kimball sent me a new one immediately! Thank God because I DID miss this thing. Makes my life alot easier. I had been looking for this item for a very long time. So glad I finally found it! It's great for bringing clothes outside to hang up on a clothesline. The liner has a convenient pocket for holding clothes pins. It's a little wider than my very old one, so doesn't fit as well on my hip while holding it with one hand for carrying. So far so good. It is sometimes hard to open up as the wheels hook on to each other, otherwise it is fine. I consider this item to be light weight and flimsy. Use with care to avoid breaking it. I use it to carry my laundry from the dryer. Cart was nice, but bag was not. The cart was very nice but the bag was made from cheap material that tore the first time used and also was not deep enough to hold the laundry. The cart was easy to put together but the laundry bag that came with it did not hold much. I threw that bag away and used a bag from my prior laundry cart. The cart and bag should hold a full load of dried laundry not a small load only. I have medical conditions where I cannot bend much so this design is wonderful. I've ordered these before and it's always a surprise whether or not it will work or not. The tubular steel that makes it light weight are secured with tab buttons. The welding on those buttons in the tube is not the greatest so if you get a crummy one, your cart will come apart alot and be pretty useless. The liners....they USED to be much thicker material and they slipped over the end bars further down. Now the cheaper material is flimsy and one rest just at the top of the tubular frame. When folded, the cover slips off. The wheels arent the best but I still need this for its function. I wish MK would go back to the better liners. Nice Cart, Bag Could Be Better!! Really like the cart but the bag could use some improvements. The bag could be a little bigger and there should be some way to fasten it to the cart (when you take items out of the bottom of the bag it pulls off of the frame of the cart). Also, the wheels do not spin very well, they seem cheap. The laundry cart does it job after getting the wheel to fit the leg. The structure is flimsy so don't put anything heavy in it. Use cart to take wet clothes outside to clothesline. After they are dry, use cart to bring them back to house. This the second cart I have bought. Very hard to put together unless you have lots of strength. Bought the flowered bag and it is very poorly made. I had my first cart for years and doubt this one will last that long. Price is way too high for the quality of this cart and bag. Can't get replacement wheels anywhere! Overall this cart works well. The foldable feature is great for smaller utility rooms. However my biggest gripe is that one of the wheels has broken and you can't get a replacement anywhere. Its a 6mm caster and the only place I found online that can supply it will cost anywhere between $25-$30!! $60.00 for a set of 4. You'd be better off purchasing a higher quality cart that has replaceable casters. Loved it until wheel fell off, found plastic part inside that was a compression fit on axle of wheel assembly had a broken v shapped part that caused it to fall off, and I cannot find a replacement to the size of about 2". The same thing (style wheel) only larger was available at hardware store. This would not fit or screw into the metal leg as it was too big in diameter. Since I have used cart for less than a year, I feel very unhappy. I was very excited to get this cart, since I am disabled and it is hard for me to carry anything. The cart was as advertised, however, the bag was not cut/sown correctly and does not fit the cart, so it is unusuable. I now have to call and see if I can get a replacement, or pay for a new one so that I can use it. I was very disappointed in laundry cart. Legs are attached by push buttons but two of them were broken and stuck inside the hollow leg pipe. I would have returned it but it cost more to ship back than it was worth. Beware, there is no support from wdrake regarding replacement parts. A wheel broke on mine and they were unable to provide any information for a replacement part. What I received was made out of very weak aluminum. The legs bent in two the first time I folded it for storage & made it not usable. Also, the cover was not big enough (or deep enough) for the cart. Would fall off every time I tried to put clothes in it. Customer Rep was very nice, and credited my account immediately. Fabric doesn’t stay in place and not very sturdy. Waste of money! Thank you for your review. We are sorry to hear the Laundry Cart was received defective. Please contact our customer service by email at walterdrakecsr@silverstarbrands.com or by phone at 1-800-858-4979 and we can assist you further. We apologize for any inconvenience this may have caused. The tubular frame does not hold up. All my comments have been added above. Waste of money! DO NOT BUY!! Wanted one of these for years. Hubby finally bought me one for Christmas. BIG waste of money. It is poorly made and very flimsy. Legs bow in and the thing falls over every time I try to roll it somewhere. Not as nice quality as the one my mom had when I was growing up. I am VERY disappointed and wish I had my money back. The frame is not sturdy at all. Had to use safety pins to hold basket on frame and it's shallow. I was disappointed with this product. It went together easily but did not stay together. If you put any weight in the basket the metal legs came apart. My husband took electrical tape and taped the areas where the legs connected which made it usable. I would not purchase this product again. although the assembly is tricky it is possible to put it together, but doesn't hold, top portion fall off as soon as you pick it up, the spring pins don't fit through the hole made to accept them, even thought the holes match up. Garbage not worth the money. Just received this cart today. Assembly was ackward, wheels will not stay on, there is no pouch in the very flimsy clothes basket, and there is rust on the metal legs. Did I get a piece of junk!! Never order again. Sorry I spent the money. Of no use to me whatsoever. I really like the concept of this item--however, the bag is way to small for a family laundry. It needs to be deeper to hold more. My other one was and I miss it. Have to empty this a few times a week as the other one had to emptied only on wash day. I am not a person who washes clothes everyday. Very disappointed. I hope this will be easily moved from place to place. My parents are disabled and this will help my mom be able to get her clothes to and from her laundry room. Thank you! To make my laundry easier on my back. This laundry cart is going to not only save time ! It's going to save my back !! Its got wheels so it will be perfect for my larndry room ! Thanks Walter Drake !!! Carrying laundry is so last century. I need laundry carts to keep the clothes organized and off the basement floor. Very excited about these. I hope they are as easy to assemble as stated. Because I am elderly and disabled and this will assist me in doing laundry. To make retrieving clothes easier from washer and dryer. So I don't have to carry laundry basket. Easy to move from room to room. Idon't have to stoop over to use this. I have gotten up there in years now and it is hard for me to carry a basket of clothes down hallway from hampers. easier to take laundry to designated area in apt complex. Tired of kids putting laundry on floor and this seemed like the perfect item I have been searching for. I bought one for our house, very happy with it. Now buying another one for my mother to replace the one she’s had for 40 years! My washer is on the opposite side of the room from my dryer. I love line drying my washing and have used a trolley in Australia. Very hard to come by a laundry trolley on wheels at a reasonable price in the US. where are the replacement bags? BEST ANSWER: As I recall, the replacement bags were offered at the same time and in the same ad as the laundry cart. There was a print replacement bag offered for an additional price. However the bag that comes with the cart has lasted me for a few years with no problems. When you type in laundry basket with wheels in the search box the basket will come up. Just below it will be a image box with the replacement bags. You can also type in laundry cart replacement bags in the search box. They are on sale at this time. It comes with one bag, but you can purchase extras separately. I have had mine for almost 2 years and still using the same bag that came with my original purchase, (I do laundry once a week, about 5 loads), and it is still like new. Thank you for your question. The extra liner is sold separately from the cart. You will want to look at item 310108 for the extra liner. We hope this information is of help to you. I believe they can be purchased from the same manufacturer that you got the laundry cart from. Think the ad says that they are available. Hope this helps you. The replacement bags had to be purchased separate. Not included in original purchase of laundry cart.